The T4 package is a widely used Windows-based touch screen EPoS system that is suited for many types of retail shops from DIY stores to fashion outlets. The software is used at over 100,000 stores worldwide. Whether you run a single premises, a chain of stores or a wholesale / trade counter, the T4 Retail EPoS package is loaded with comprehensive features to support your business. Yet it is fast to setup and simple to use. It is pre-loaded with the internationally established QuickStore EPoS software to meet a variety of retail requirements, together with a customer database, stock control, purchase ordering and barcode label printing (with optional label printer). The standard package includes the latest, high performance Titan S265V Windows-based terminal with its modern slimline design. Each package from EposSystems.Com is supplied with a fast thermal receipt printer, laser barcode scanner with stand and a secure cash drawer. Wireless barcode scanners, barcode label printer and hand held stock-taking terminals can be optionally added. The system can also print A4 size invoices and statements in addition to mini receipts by adding a desktop printer to the package. QuickStore is an excellent EPOS software program that is very easy to set up and use. It will let you process retail sales transactions speedily, maintain a customer database, offer discounts and register various payment methods such as cash, credit/debit card, coupon, voucher, token and so on. A range of reports are available for end of day cashing up, sales analysis by product, category and supplier, stock levels and stock valuation and other management and accounting reports. The optional upgrade to the Professional Edition provides many additional staff performance, business management and financial accounting reports as well as advanced functionality. The Enterprise Edition allows multiple branches to communicate to a head office for centralised reporting and database maintenance, giving you total control of your retail / wholesale business. Click the link below for fuller details of the software features. 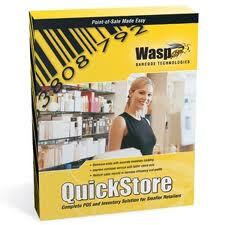 QuickStore is an internationally established software package from Wasp, with over 100,000 installations worldwide. It is a comprehensive yet affordable solution for all types of retail fashion outlets and covers all the processing from purchasing, booking in stock, printing barcode labels, retail sales, account customer sales and a wide range of sales, stock, financial and management reports. Saturday 20-April-2019 00:01 Our office is currently closed. We will be open again from 9.30am Monday.